This silver plated Claddagh bracelet is a cuff style design that is enhanced with filigree Celtic knot-work extending from the wrists. 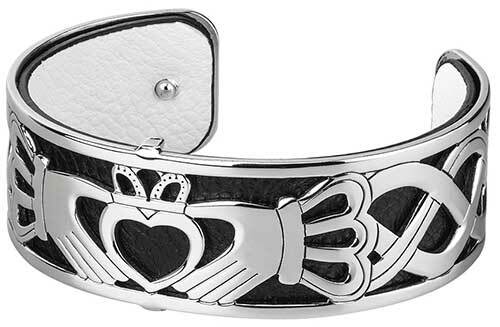 The Claddagh cuff bracelet features a leather insert that is both reversible and removable; you may wear your bracelet three different ways. 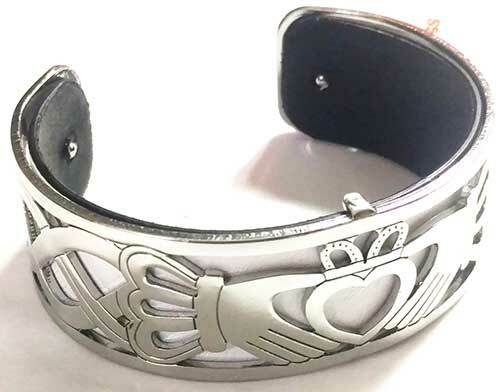 The leather insert is black on one side and white on the other side; the leather Claddagh bracelet measures 7/8" in height and will fit most woman's wrists. 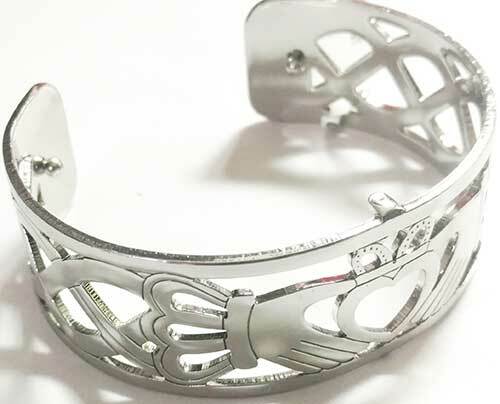 This Irish bracelet is made in Dublin, Ireland by Solvar Jewelry; it is gift boxed with Celtic knot and Claddagh history cards, complements of The Irish Gift House. Celtic cuff bracelet features a removable and revisable leather insert that is dark umber on one side and pumpkin on the other. Celtic cuff bracelet features the Dara strength knot along with a removable and revisable leather insert that is rose on one side and blue on the other.